All Associates and Focal Points, membership have a Vision of where they would like to focus their energies, for some this in encouraging school teachers to adopt Living Values activities, some building partnership with education departments in their country, introducing Values into the curriculum of the Teaching Universities, some on prison reform, within relationships, others are called to seek involvement in the refugee crisis. Business can benefit from introducing Values in the management and workplace, in Human Resources. Parental guidance for better family life and Green Values for the environment. The world offers a fertile field for the creation of Values Based Atmosphere, the expansion of Values Awareness. No matter where or how, it all starts with desire and inspiration. Here is Living Values Indonesia's five year Vision. Karuna Bali Foundation, the ALIVE Associate in Indonesia, runs Campuhan College a school in Ubud, Bali, and uses the LVE Approach as the foundation of its teaching and learning activities. Many of the College’s students are high school graduates in financially challenged circumstances who do not otherwise have access to further education and they are offered a fully-sponsored one-year full-time Values-based Leadership course. One of the features of the course is focused on the concept of “Paying Forward” with an annual event to support the cost of sponsoring students for the following year. In August, at the beginning of their course, each of the 25 students selects his/her own values and commits to “living in” those values for the year. The students are taught about five basic emotional needs, namely being loved, understood, valued, respected and safe, and they and the course facilitators then collectively decide on what best practices can help ensure that those needs are met. Indonesian commemorates the 73rd Independence Day in August 2018. LVE trainers from all areas celebrated Independence day in different ways. Some fun activities were held to express, explore, and at the same time nurture the spirits of peace, happiness, and freedom. In this country update we would like to share and accentuate the three interconnected values which emerged from the stories; peace, happiness, and freedom. Since January to August 2018 Jalan Merajut Perdamaian (JMP) community has done a series of values activities in some areas in Maluku islands (the Moluccas). 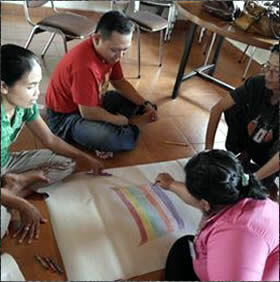 Eklin de Fretes, a young leader of JMP and an active LVE trainer, together with 5 to 7 facilitators created and implemented the peace program voluntarily. By August 16th 2018, JMP has reached out 72 spots all over Maluku to share the spirit of peace with children through fun-activity called Peace Tale. This program was started to promote unity and harmony among children from different communities. Eklin and the other JMP’s facilitators realized that many children who were born after the period of conflict to some extent inherit the feeling of segregation with people from different group (religion) while the adults keep repeating the narratives of segregation. Many generation in Maluku including JMP’s volunteers noticed that some children have been labbelling and treating each other as opponents, using negative terms which were taken from old narrative frequently retold by the adults. These young volunteers understand that there are always consequences of assembling hurtful memories, experiences, or episodes within the narrative; it might generate the ideas of exclusion towards others and themselves. They invited everyone who search for peace in Maluku to put an end to this negative cycle. They relentlessly promote values through fun and creative activities. They tried to make the children and adults to reconnect with their authentic values and at the same time to build children's character of peace in the most possible way. “I call it Peace Tale. Children from different backgrounds share peace stories. I started this storytelling program on January 2nd, 2018 in front of interfaith community in Seram island.” Eklin added, “On 17th of August, 2018, together with young people from Taman Baca Haturessy, Negeri Tulehu, we held the summit event of the series of activities entitled 73 Peace Tales Spots as a celebration of 73 Years of the Independence”. 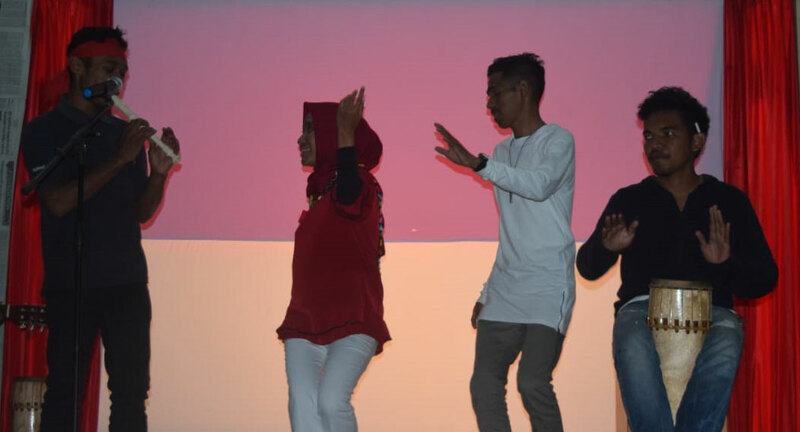 Besides collaborative storytelling, there were also various programs performed in the event such as poetry musicalization, theatrical performance, singing, and a small offerings procession from youth interfaith community. To conclude the event, a charity activity was held as an expression of compassion and solidarity to the people in Lombok who were recently affected by the earthquake. “JMP appreciates and is very grateful to all participants in this program. May God bless us. Let’s love Indonesia in one or many other ways!”, Eklin concluded. To celebrate the 73rd Independence Day of the Republic of Indonesia, Yayasan Indonesia Bahagia (YIB) dan InLOVE Community, created a video as a campaign tool. The purpose of this video is to interpret the meaning of independence in today’s context and to promote the spirits of happiness of Indonesian society. The video has been disseminated since 17th of August, 2018 using Intagram account @indonesiabahagia.id. Afni, one of the videomaker, stated “We present influential figures from different professions narating the meaning of independence day“. It is aimed to promote happiness through Indonesia Bahagia campaign. The organizer of the video making is the InLOVE Community. InLOVE community is a group of 6 young LVE trainers who focus on social media content development. “We hope the value of independence we want to convey through this activity can raise the value of happiness. The key message we wanted to share is each individual has the right to be free, independent, and happy” Afni added. Yayasan Indonesia Bahagia has been doing the campaign called Gerakan Indonesia Bahagia (GIB), an initiative to promote value of happiness for Indonesian society. Rani Anggraeni Dewi, the initiator of this campaign and coordinator of YIB, worked closely with other 8 LVE trainers: Kamalia, Fathurrahman, Milastri, Afni, Eka Zamani, Tantri Maharesi, Dini S, Yudhy W. and Ita Mucharam. They believe that nowadays, the society need to closely reconnect with the values of respect, tolerance, freedom to nurture the values of happiness. “GIB is one of practical implementation of LVE trainers’ knowledge and skills. These knowledge should not stop in the form of workshops and campus-based activities. I want to make it more inclusive. We conducted many activities in public space like in city parks, like the one we held to celebrate the International Happiness Day”, she added. We gladly received a short update from Fitria Laurent, our LVE trainer who lives in Padang, West Sumatra. Fitria has facilitated numbers of Living Values Educator workshops. 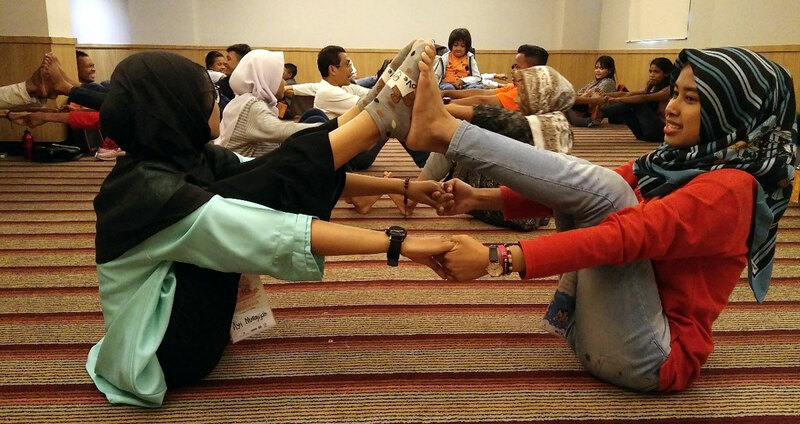 After LVE workshop held in February 2018 with 16 participants, Fitria coordinated the 16 values activities facilitators to share and practice their LVE skills voluntarily with 385 children on the age of 6 to 12 years old in Padang city with the support fromYayasan Anak Shaleh. The children enjoy fun-activities facilitated by 2-3 facilitators with the duration of 3 - 4 hour per day, 4 days a week. These children are devided into 6 groups. The after-school activity has been conducted for about 6 months now. The volunteer from this workshop, Fitria, remarked that she feels happy to be a volunteer for this activity because the children did not have a safe space to play. Now, they have this special little space to spend their after-school time. 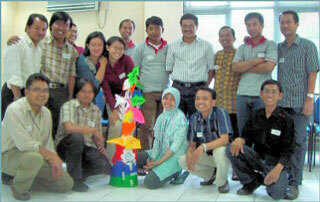 “The 16 facilitators for this fun-activities are those that I have trained myself in LV Educator Workshop. I’d like to give them space to practice and expand their facilitating skill”, said Fitria. 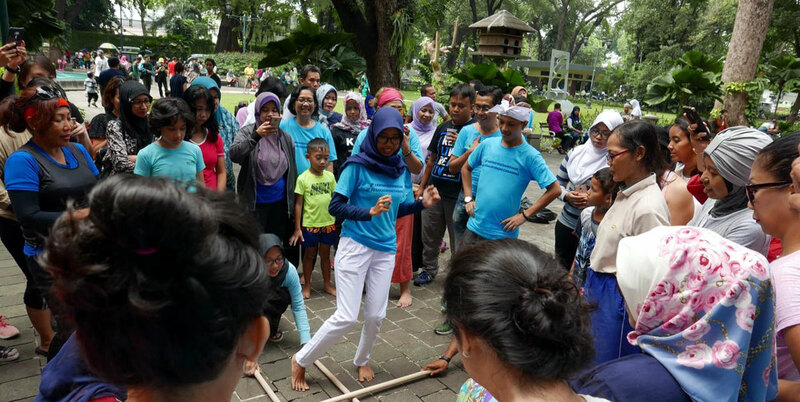 To participate in the National Children’s Day, some LVE trainers carried out a series of LVE fun-activities in an event which took place in Surabaya on 20th to 22nd of July, 2018. The event was organized by The Asia Foundation’s PEDULI program. 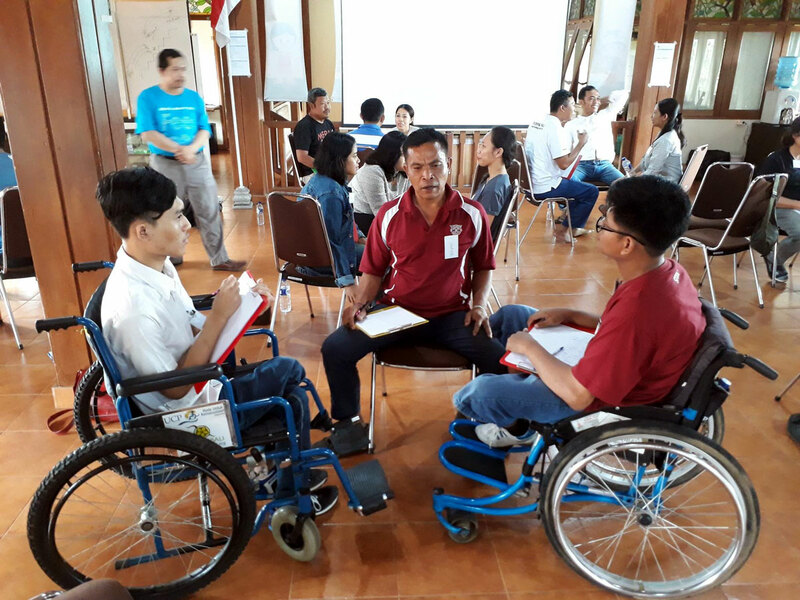 Budhy Munawar-Rachman, Mochamad Ziaulhaq, Eklin De Fretes, and Yudhi Widdyantoro facilitated some values activities for children which also include children with disabilities, focusing on values of Peace and Tolerance. These activities allowed the children to explore, experience, and share those values. By conducting the activities, the trainers provided a space for children to express their values creatively using images, poetry and dance. At the end of the session, the children got the opportunity to present their work pieces in front of the audience. The Asia Foundation also participated in a National Workshop entitled Religious Moderation Mainstreaming as the Implementation of the United Nation Human Rights Council Resolution 16/18 was held by the Ministry of Religion of the Republic of Indonesia on 27 of July, 2018. Taken place at the Royal Kuningan Hotel, Jakarta, this workshop was facilitated by Budhy Munawar-Rachman and Mochamad Ziaulhaq. This workshop introduced the Living Values Education approach to the members of the Ministry of Religion. Zia emphasized the importance of living and sharing values among one another through social activities. “Let’s bring positive contribution to our society”, Zia added. Since mid-2017, some LVE trainers contributed in developing a guidebook entitled Pendidikan Nilai Pancasila (Pancasila Values Education) under the project of The Asia Foundation and Badan Pembinaan Ideologi Pancasila (BPIP). The development of the guidebook was prepared by Dr. Budhy Munawar-Rachman, Mochamad Ziaulhaq, M.Ag, and Dr. Bambang Qomaruzzaman, M.Ag. This guidebook prioritizes the strengthening of the knowledge about LVE Theoretical Scheme and values based activity skills. 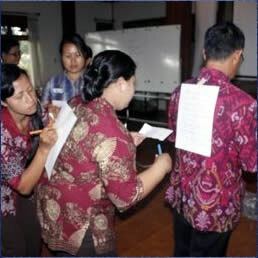 This method has two main functions: providing a value-based atmosphere simulation in the educational process and living the values of Pancasila in the learning space (internal function) so that the participants can experience the Pancasila values-based atmosphere and to implement it in their social life (external function). A series of FGDs, seminars, workshops, and training were conducted in several Islamic Religious Universities by Dr. Muqowim, and Rani A. Dewi, MA. following the development of the guidebook. In August 2018, this book was used in some trainings for lecturers and teachers of Pancasila subject at Pusat Pengembangan Madrasah Kanwil Kemenag Jawa Barat dan Prodi Religious Studies Pascasarjana UIN SGD Bandung, Institute for Southeats Asian Islamic Studies (ISAIS) Riau, Faculty of Tarbiya and Teacher Training, UIN Sultan Syarif Kasim Riau, and PUSAM, Postgraduate program of Muhammadiyah University, Malang. Another three days successful Living Values Educator workshop was held in Campuhan College on 20-22 July 2018. 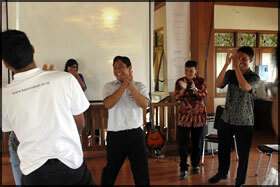 It was facilitated by LVE Accredited Trainer of Living Values Education Indonesia, Muqowim and Wayan Rustiasa. 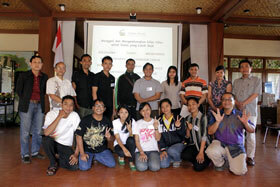 The workshop participants came from Bali, Pekanbaru, Jogjakarta, and Lombok. They experienced a deeper understanding of how values live and guide their life. The various background of participants including academics, midwife, young enterpreuneurs, acupuncturist, and psychologists, in this workshop enriched the process of growth for each person. Together they practiced to create a safe zone during each session. The positive atmosphere helped every person to share with one another, something that is not always be experienced in everyday life. Conversations got deeper as each day passed and understanding about core values were increased. One of the participant from Riau mentioned that from this LVE workshop, he can learn to appreciate himself better like he has never done before. He believed that his entity consists of the body, soul and spirit, and he has to give attention to these three. The appreciation for himself is fulfilled during this workshop. Another participant said that by joining the workshop she would be able to recharge her life energy, be more powerful, and understand more about the 5 basic feelings needed by each person, feeling loved, understood, valued, respect, and safe. As they weaved through the journey of understanding the values and living them; the sensation, the feelings, and the friendship are the ones they will cherish and hold dear for the rest of their lives. During the first week of August 2018, 24 new students of One Year Professional Program and all of the facilitators engaged in a series of activities in Campuhan College’s Open Heart space from morning until late afternoon. The facilitators introduced the Living Values Education methods as the foundation of teaching learning activities applied in Campuhan College. In that event, each students selected their main values to be nurtured during their study. In the session of Creating Collaborative Rules, the students were invited to explore and experience their five basic emotional needs i.e. feeling loved, understood, valued, respect, and safe. The facilitators and students also decide the best practical way to fulfill those needs. One of the students, Sky, stated that “The most memorable session was when I can recognize my five basic emotional needs, I also surprised to know that people also have the same needs like I do.” By understanding their needs and needs of others, the students are allowed to take part actively in maintaining a supportive teaching learning environment with the assistance of the facilitators. Hopefully that their spirit of togetherness and willingnese to respect to eachother are getting stronger from time to time. September 6th – 8th, 2018: Living Values Educator Workshop, SMU Rosma, Karawang, West Java. September 28th – 30th, 2018: Living Values Educator Workshop, Campuhan College – Karuna Bali, Ubud, Bali. Refresher Course for LVE trainers and facilitators – Jogjakarta Cluster, November 2018, Rumah Kearifan (House of Wisdom), Jogjakarta. Refresher Course for LVE trainers and facilitators – Ambon Cluster, November 2018, Parakletos - Ambon. Series of LVE workshop – weekly basis (every weekend), November 2018 to January 2019, Greenschool, Bali. LVE Train the Trainer Workshop (TTT) 2018 will be conducted next year. “As we enter 2018, LVE Indonesia is engaged in an in-depth process of organizational reflection. After eight years of presence in Indonesia, association leaders are looking at the journey. Some questions have come up: How well are we at fulfilling our mandate? How will we grow together as living examples? How can we contribute to emerging a culture of peace in Indonesia in the future? A preliminary Focus Group Discussion (FGD) was initiated by Budhy Munawar Rachman on September 11, 2017 in Jakarta. It engaged nine active LVE trainers. One of the recommendation for LVE Indonesia was to develop an organizational Strategic Plan (SP) for 2018 – 2022. There is an expectation that LVE future programs and activities will be able to provide the educational approach, philosophy and practice to promote a positive atmosphere at different levels: personal, inter-personal, institutional, and community levels. On October 2017, we invited trainers and partners to take part in providing input and sharing thoughts via a questionnaire, WhatsApp group, emails, etc. 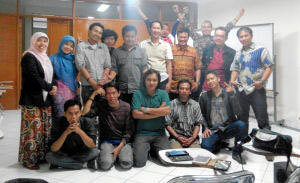 The associate wants to find all possible ways to improve its service for its many LVE trainers throughout Indonesia. The next step will be a Trainer Meeting for Strategic Planning on 26-27 January 2018. About 20 active trainers were invited to share ideas, identify challenges and opportunities and define a common purpose. Hopefully, we can find strategic ways to optimize and at the same time to measure the impact of the LVE program in the future. A series of LVE activities for a Local Educators Workshop began in November 2017 at Green School. This workshop will be completed by the end of January 2018. It is being conducted by Kulkul Connection, Green School, and facilitated by I-Made Perdana Skolastika. Seven of a series of nine LVE activities for local educators have been delivered to 60 students of Sekolah Tinggi Ilmu Bahasa (Foreign Language College) in Saraswati Denpasar. On Saturdays the students gather in Green School’s open hall for the activities from 10 AM to 1 PM. The aim of the workshop is to provide basic knowledge and skills about how to generate a values-based atmosphere in the classroom for students who are going to be English teachers. A number of LVE trainers from both Indonesia and abroad took part in the Gebyar Ilmiah 2017 (Scientific Feast 2017) in Yogyakarta on December 11–13, 2017. It was a successful international academic event held by Fakultas Ilmu Tarbiyah dan Keguruan (FITK), Universitas Islam Negeri (UIN), and Sunan Kalijaga Yogyakarta (Faculty of Islamic Education and Teaching Methods, Sunan Kalijaga Islamic State University). The event was divided into 15 parallel activities such as conferences, seminars, Focus Group Discussions and LVE for Educators workshops. About three hundred people, including students, lecturers and various educational activists, participated in the event. There were several organizations supporting the event, including The Asia Foundation (TAF), Association for Living Values ​​Education (ALIVE) International, LVE Indonesia/ Karuna Bali Foundation, PUSAM UMM (Center for the Study of Religion and Multiculturalism of Muhammadiyah University) Malang, Organic Yoga, Asosiasi Guru Pendidikan Agama Islam (AGPAI stand for Association of Islamic Education Teachers) and Rumah Kearifan. 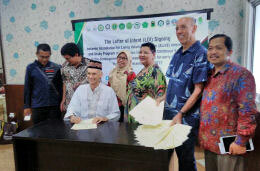 At the end of the event, the initial step for collaboration was taken by the signing of the Letter of Intent (LOI) between 15 agencies of UIN networking and ALIVE International. Also related to International events, Indonesia become the host for the ALIVE Board Meeting held on 15-16 December 2017 in Yogyakarta. Chris Drake, President of ALIVE International, inviting paticipants to a refresher exercise called “Mango Tree” before starting his presentation. LVE for local educators - Green School - Bali - November 2017 - Januari 2018. Philipus Yusenda form LVE Indonesia, one of presenter in the seminar entitled “Values-Based Digital Literacy in Millennium Era”. One: Trainers Meeting on Strategic Planning, 26-27 January 2018, Yogjakarta. It is organized by Karuna Bali. It will involve 20 trainers. Two: LVE for Educators, 22-24 January 2018, in Malang, East Java. It will be attended by around 30 Lectures of Universitas Muhammadiyah Malang (Muhammadiyah University – Malang). 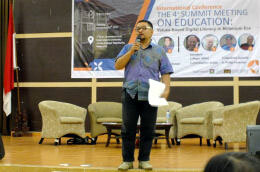 Three: LVE for Educator, 16–18 February 2018, Jakarta. It will be conducted by Zakhir Foundation. 15-20 teachers and management staff are expected to attend the workshop. Warm greetings from Bali, Indonesia! Here we have some very unseasonal weather patterns, sometime there are torrential rain, even some ice and snow, interspersed with scorching heat. Rain does affect workshops here, as they cause quite a disruption of sea and air travel, two travel modes that are most common here. But it does not stop LVE trainers all over Indonesia in delivering workshops. During the period of January to April 2017, there were 26 3-days Educator Workshops happened all over Indonesia. There were 589 participants, consisted of teachers, lecturers, principals, deans of teaching faculty, university students who will become teachers, and parents. A special mention to The Asia Foundation (Mr Budhy Munawar-Rachman and others) for running the program to build the capacity of lecturers in Tarbiyah Faculties (Teacher Training Faculty) of State Islamic University all over Indonesia. 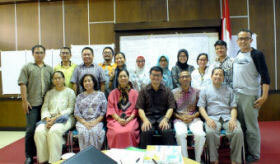 These lecturers in turn will train future teachers which will become the backbone of Indonesia’s education system. There’s also Yayasan Indonesia Bahagia (Happy Indonesia Foundation, Ms Anggraeni Dewi and her team) which focused on providing training for young parents in Jakarta area. While on the eastern side of Indonesia, Parakletos Foundation (Ms Elsye Syauta Latuheru and team) bravely sailed the Mollucan sea to deliver workshops in nearby islands, inn Bali, Green School (with Mr Made Perdana Skolastika as trainer) also got into the act by delivering their CSR (corporate social responsibility) by delivering free LVE workshops for teachers of several nearby local schools. With all these works we have to deal with, we really need LVE trainers. That’s why now we at Karuna Bali Foundation (the ALIVE associate in Indonesia) decided to make Train-the-Trainer workshops an annual event. This year we held the TTT workshop in Bandung, West Java, in order be close to the State Islamic University of Bandung, where most of the candidate trainers teach. From 15 to 19 March 2017, 21 candidates train themselves under the guidance of Ms Taka Gani as lead trainer and Mr Philip Yusenda and Mr Mohammad Ziaulhaq as co-trainers. These candidates have prepared themselves for the last two years by attending educator workshops and interning under one of the senior trainers. Out of 21 participants, 20 new trainers were willing to sign the contract to become volunteer trainers of LVE Indonesia. 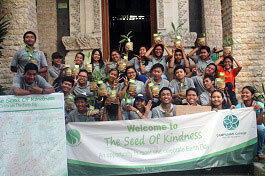 The one-year students of Campuhan College in Ubud, one of the programs of Karuna Bali, did a special project this year on April 23rd called The Seed of Kindness. An annual project of these LVE students, one purpose is to raise awareness in the surrounding community about values application in daily activities. 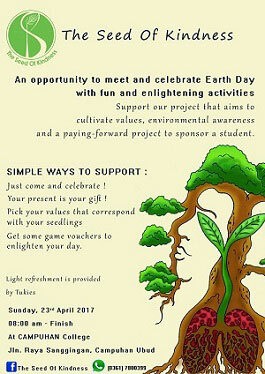 They use seeds as symbols of values with the aim of also cultivating environmental values in celebration of Earth Day. They raised enough money last year to sponsor one of this year's students. They have demonstrated their values, showing that the essence of values is perpetuated. Acting in our values does great things and changes lives. Congratulations to all the young adults at Karuna Bali. The History of LVE in Indonesia can be traced back to 1997 when Ms Helen Quirin (1946-2016) started using LVE methods in her school and neighboring schools. With Ms Dana Streetman, Helen also translated and recorded LVE songs into the Indonesian language. When Ms Taka Gani return from TTT in Oxford on 2002, LVE started to grow outside of the school system, especially in community development programs. Ms Diane Tillman, one of the initiators of LVE, especially came to Indonesia to give a workshop on LVE for Street Children for eight days in the same year. In 2003, LVE was used in a peace building and trauma healing program. This project was designed for children in Ambon and Seram, where communal war wrecks the community, under the coordination of CARDI and Jesuit Refugee Service (JRS) Indonesia. 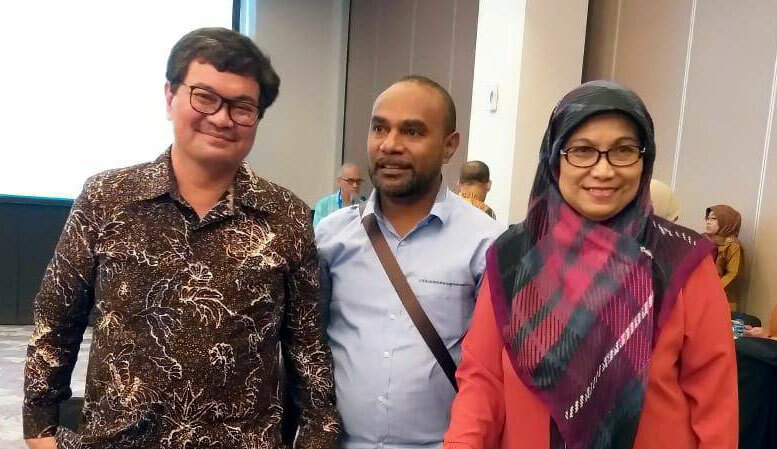 Up until today, LVE methods are still in use for peace building in the area, both by Parakletos Foundation and Ambon Reconciliation and Mediation (AMRC) of IAIN Ambon. 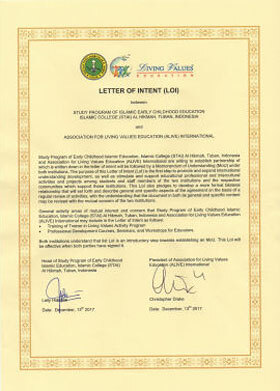 In December 2008, Karuna Bali Foundation, based in Ubud, Bali, was approved as the Indonesian ALIVE Associate of the Association of Living Values Education International. The national LVE association is also known as ALIVE Indonesia, and has the mandate to develop and maintain the LVE trainers network in Indonesia. 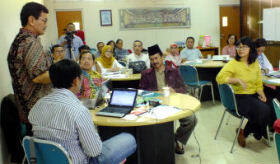 The Associate works with a number of organizations that are in line with the LVE vision, one of which is The Asia Foundation (TAF) with its implementing partners in Jakarta (Paramadina Foundation, Paramadina University, PPIM UIN Jakarta, LSAF), Yogyakarta (LKiS, Mata Pena, Puskadiabuma UIN Yogyakarta), and Ambon (ARMC IAIN Ambon, Parakletos Foundation) . Another cooperating organization is Jesuit Refugee Service with its accompaniment of internally displaced people (IDP), refugees and asylum seekers in several nodes of Indonesia. From 2009 to 2014, The Asia Foundation and its partners actively supported LVEP development through its "Pendidikan Menghidupkan Nilai" program, with LVE workshops for teachers and lecturers of madrasah, Islamic boarding schools, schools, and universities. One of the program’s goals is mainstreaming high quality values-based education where values can be implemented directly in daily life. Great attention was given to character based education by integrating the approach in all subjects. During the program, at least 10,119 teachers and 1.423 lecturers from schools and universities all over Indonesia were involved. The evaluation of this program was published in a book format titled “Success Stories” by TAF in the Indonesian language. Parallel to TAF programs, JRS since 2009 also intensively using LVE methods in its accompaniment of post disaster and post conflict communities in Aceh province. Many schools benefited from this program. As one of the teachers put it: ”I learned new effective ways to deal with the kids without hitting them.” The report of this program for schools in vulnerable areas was published in a book format titled “Menanam Pohon Perdamaian” (Planting the Peace Tree) by JRS in the Indonesian language. Beside communities, JRS also uses LVE methods for asylum seekers and the refugee community (those who await refugee status approval and resettlement to third countries) and in immigration detention centers. Karuna Bali Foundation as the Indonesian ALIVE Associate also implements LVE in its program, especially on Campuhan College (a one-year program for high school graduates who wish higher education) and EduCare (accompaniment for schools in rural areas which want to implement LVE). A lot of lessons have been learned, especially the need for educators to live their values totally before facilitating values awareness in students. All this ensures that the Karuna Bali Foundation can become the gold standard for implementation of LVEP in Indonesia. Beside these programs under the foundations named above, there are many requests for training from schools and institution from all over Indonesia. In 2015, there were 48 LVE workshops, from the eastern most point of Palembang to the western most point of Ambon. In 2016, there were 41 workshops involving 1055 people. This only counts three-day Educator Workshop. There are many more one-day seminars and professional development courses. The numbers suggest strongly that LVE has been accepted in many educational institutions. There are many challenges ahead, but the LVE trainer network in Indonesia will keep on transforming education in their beloved country. Prior to Celebrating World Interfaith Harmony Week in Ambon. For the last three years, the Peace Education program in Ambon, a collaboration of The Asia Foundation, State's Islamic Institute of Ambon, and Parakletos Foundation, has been working hard in sowing the seeds of peace in the land broken up with strife. More than 300 facilitators of LVE and Peace Education have been trained, more than 10.000 students, teachers, and members of communities have been involved in peace education activities. Let's hope that next year, we can expand this Peace Education program even wider. Since January 2015, LVE Indonesia has partnered with the Religious Studies Post Graduate Program of State's Islamic University (UIN) Bandung. The partnership was designed to ensure the creation of Peaceful Society in Indonesia, especially in West Java province. This partnership focused in integrating LVEP into the Living Values, Spirituality, and Religions (LVSR) coursework. This pilot program will end by May 2015. The LVSR program has several milestones: (1) LVE becomes a course in Religious Studies Post-Graduate Program at UIN Bandung that can provide a growing space for academicians who truly live their religious values in a peaceful way. (2) LVE becomes an alternate method for lecturers, educators, and wider communities to shape community character. (3) LVSR becomes a model that is applicable in many more class rooms. LVSR itself was developed from LVEP Educator Training Guide, Diploma of Education in Values and Spirituality, Living Our Values, Interfaith Dialogue, and several other pedagogy approaches that support LVE materials. All this material was combined into a new reference called Modul Living Values, Spirituality, and Religions. The direct beneficiaries of the LVSR program are the students of the Religious Studies Program. The indirect beneficiaries are the lecturers, religion instructors, educators, and social facilitators that give communal services. The knowledge of LVE and peace building methods enables them to assist their communities to create a peaceful and respectful living, in a very practical daily ways! Thirty-two heads of state and 92 delegates of Asian and African countries arrived at the 60th anniversary of the Asia Africa Conference on April 23rd, 2015, in Bandung, West Java. The first conference was in Bandung 60 years ago. History has noted that the Asia Africa Conference held here inspired the world for a more peaceful world, respecting the sovereignty of all humans, especially in Asia and Africa. Today, Bandung has become a city that inspires peace and respect of sovereignty. 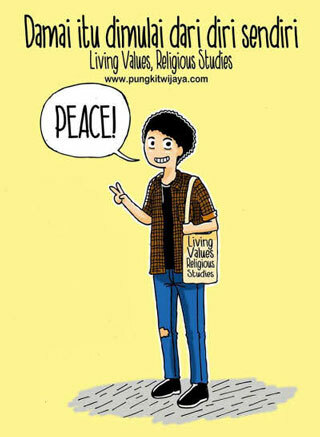 To live up to the “Spirits Bandung”, the West Java Cluster of ALIVE Indonesia established two movements to create a model of Peace Culture Education based on Living Values Education. The first movement is the comprehensive theoretical study of LVEP at the Religious Studies Program of State's Islamic University Bandung. Besides touching the students, the educator workshops provided through this program have also involved Islamic religion instructors from the Religion Department and teachers from the Education Department. We the teachers of Bandung, emphasize again that Bandung has the spirit that liberates Asian African countries. As a spirit, it's not just a nostalgic memory, but also an energy that demands a continuation. The 60th anniversary of Asia Africa Conference is not just a remembrance of the bravery of a group of people to gain their independence, but it is an unfinished historical marker that demands completion. We understand that after independence, the problems of a nation are not finished. Independence means to create our own destiny with heads held high, full of pride. But today, most countries in Asia and Africa have the same conditions: human resources that are baffled by globalization, natural resources nearing depletion, and sectarian violence. After independence, nations in Asia and Africa face a complicated challenge: how to live together in peace, love and respect. We acknowledge that the “Dasasila Bandung 1955” (10 Points of Bandung 1955) has not anticipated education as the basic ingredient of independence. Thus we, the teachers of Bandung, would like to remind all teachers of Asia and Africa that there is a need to create an education system that respects freedom. Education is not just a tool to fill industrial vacancies, it is not a barrier to child growth, and it is not a space to learn hatred toward anything different. In the Asia Africa Conference we hold hands together regardless of race, skin color, and beliefs. Education in the Bandung Spirit is an education full of love toward all humanity, respecting plurality as the most beautiful divine blessing, and always working with peace in all aspects of life. We believe, if the teachers of Asia Africa base their education on the “Bandung Spirit”, that is, full of love, peace, respect, and values, the youth of Asia Africa in the future will become individuals that can beautify the world with peace achievements. We believe if the education world and the daily world is built upon the spirit of love, everyone will feel safe and valued. If life and education is built upon peace, understanding and respect will grow from it. So today, all teachers and educators of Bandung reaffirm that the Asia Africa Conference is our shared spirit, a spirit that demands to be realized in loving and peaceful education. We wholeheartedly shout out to all teachers in Asia and Africa, join us in the same spirit: to fill and beautify our independence with a loving and peaceful education! “Silih Asih, Silih Asah, Silih Asuh” That is, Love Each Other, Educate Each Other, Nurture Each Other. When Karuna Bali Foundation undertook the role of the Indonesian Associate for the Association of Living Values International back in 2008, one of the things that really haunted us was the enormous scope of the work. Indonesia is a country wide enough to have 3 time zones, scattered enough to have 13,000 island in its archipelago and big enough to have more than 250 million people with diverse cultures, languages, and religions. But as some wise people said, change can be made, one small step at a time. The Train the Trainer workshop held between September 22nd and 26th in Ubud, Bali was a reflection of this situation. There were only 9 people participating, few enough to make ensure an effective group of intense learning. The candidates came from 3 different time zones, the farthest taking 4 hours to fly to Bali. Each of the candidate trainers works in challenging situation. Some challenges arise from the different cultures that live together in a single area. Some challenges are geographic; to reach their community, some have to take a boat for 5 hours and then continue for 4 hours on a dirt bike. Two of the candidate trainers came from 2 communities in Mollucas which, during the riot in 1999-2004, created long-lasting hatred from a conflict rife with killing and burning. Both of them use LVE methods as peace education methods and, bit by bit, they are dismantling the hatred and replanting it with love and communal cooperation. The five days of the workshop was a time for all of the participants to make mistakes safely. They tried out their skills in delivering the LVE Educator Workshop. Each of the standard sessions was played out, after which a review session was shared among participants. Under the guidance of Ms Taka Gani as lead trainer, the participants learned many techniques for delivering adult learning sessions. There was also an ice-breaker sharing session, where participants shared the games that they used in workshops. A lot of new ideas were flung around, and the participants contributed much enjoyment! A Living Values Education Workshop was organized by the Campuhan Life Long Learning (CL3) team between August 22 and 24, 2014 at Campuhan College. The workshop facilitators were Made Perdana Skolastika and Philipus Yusenda. The participants came from Bali and Jakarta. Twelve were teachers and the others were from the EduCare team (EduCare Batch 13). Living Values education is a method of creating a values-based environment either at school, in the home or workplace. It departs from the assumption that values cannot be taught but only modeled, so adults living or working with children are expected to recognize the values within themselves and consciously change them. There were many sessions in this workshop. The first session on the initial day was What is the Living Values Education Program (LVEP), a session telling the participants about the vision and mission, and why LVE is important for us to know. Then we continued with Values Awareness. We invited the participants to tap into and acknowledge their inner values and to live those values and apply them to their daily lives. The next session was Create a Value-based Atmosphere (Rekindle the Dream). We invited the participants to imagine their dream school. What did the school look like and how did the students and the teachers behave? We also told them to observe the values that were implemented in their dream school. We started the second day with a Value Activity (Past, Present and Future Values). We invited them to write down one of their values which deeply influences their lives, and then to share it with other participants who had the same value. The next session was The Components of Living Values Education. We told the participants about the components of Living Values Education and held a discussion about them. We continued with Create a Value-based Atmosphere Skills (Revive the Positive Attitude). It is essential to revive a positive attitude as an example to the children. In this session we thought about what we should do to fulfill children’s five basic needs: to feel loved, safe, valued, appreciated and understood. After that we continued with Create a Value-based Atmosphere Skills, Active Listening, inviting them to respect other people through listening. We don't just need to listen to others, but to respond when someone talks to us. Many people don’t realize how important listening is, which often leads to misunderstandings. 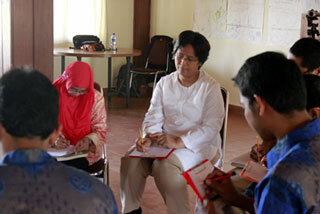 The next session was Create a Value-based Atmosphere Skills, Conflict Resolution. In this session, we gave an example of how to resolve conflict using the mediation method. The issues became real for them when we demonstrated them through drama, an effective tool to make the participants interested and help them understand. The last day was really unforgettable. We begin with Transition to Value-based Discipline. We invited the participants to realize that we need values in our activities, and that we apply those values in our activities through our discipline. We continued with Evaluation of Living Values Education Workshop. We invited all the participants to give their impressions (approval and recommendations) during the workshop. Then we introduced the Action Plan. In this session they created their own plan after learning about and understanding Living Values Education. We ended the day with Values Activity 'Creating From Nothing'. 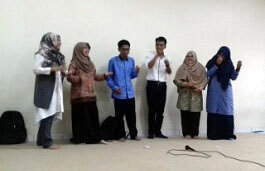 All the participants loved this session because they produced a performance with their group. They sang songs together and read poetry. It was lots of fun. Although the participants came from different places and were of different ages, they came together in this workshop and enjoyed it regardless of their ages. When they discussed things they may have had different opinions, but when they sang and played games together they were really cohesive. One of the participants said that he felt very lucky to attend the LVE workshop. His name was Ngakan Wardana and he was a teacher at SD1 (Elementary School) Number 1 in Tampak Siring, Gianyar. He attended the workshop because he was invited by the EduCare team. He never imagined he would take part in a workshop about living values. “At first, I thought I would be bored, but early on the first day I really began to enjoy the workshop and was eager for the second and third days,” he said during the final sharing process. He gained a great deal of knowledge from the workshop and now knows that the five basic needs of children are to feel loved, safe, valued, appreciated and understood. Although the workshop was short, the values will remain in the hearts of the participants. We hope that all of them will continue to share these values with the people around them, and help create a better world. On March 5th, 2014, The Asia Foundation launched a very special book in Jakarta titled “Pendidikan Karakter: Pendidikan Menghidupkan Nilai untuk Pesantren, Madrasah, dan Sekolah”. In English, the title would be translated as “Character Education: Living Values Education for Islamic Boarding Schools, Madrasah, and Schools”. This book is the fruit of four years of hard work by many educators involved in The Asia Foundation's LVE program. 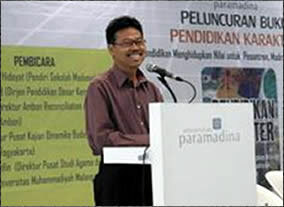 Paramadina University in Jakarta, which hosted the launch, was one of the partners that coordinated this effort. The Asia Foundation planned to print 1000 copies of this book for distribution among its implementation partners that are spread in Jakarta, Bogor, Garut, Jogjakarta and Ambon. Some of the implementation partners are universities, some are NGOs that work in peace building using LVE methods, and some are Islamic boarding schools. Besides print distribution, the book will also be available through http://www.inspirasi.co public library. 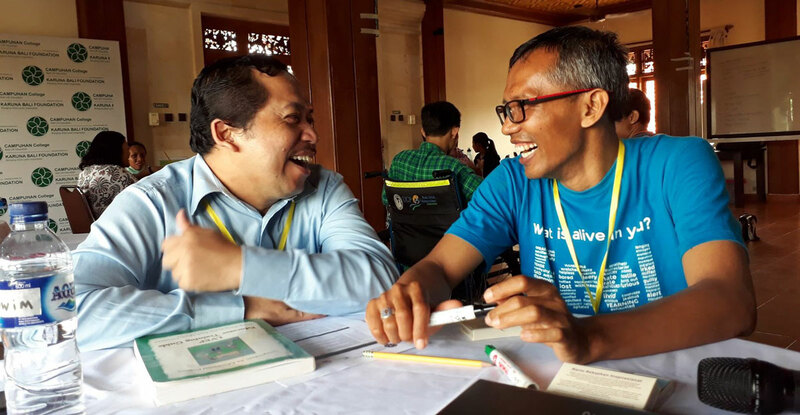 For three days in April, 22 participants were involved in a fun-filled LVE Educator Workshop at Campuhan College in Ubud, Bali, with Philip Yusenda as lead trainer. Some of the participants were teachers from local schools that are beneficiaries of Karuna Bali Foundation's Educare program, which gives local schools a gift of implementing LVE for four months in their schools. The other participants were from NGOs that use LVE in their daily work in orphanages and child centers. Mr Sani Ramdani, of Rumah Yatim Foundation, an NGO that manage orphanages in 14 provinces in Indonesia, has a different take: “It's fun, and at the same time daunting. Being a value role model mean you really have to live the values 24 hours 7 days a week! This is especially true in an orphanage setting, where you really live with the kids all the time.” Rumah Yatim Foundation plans to start a one-year pilot program to use LVE as their fostering method in June 2014. Living Values Education was first introduced in Indonesia on the year of 2002. The growth of Living Values Education in Indonesia then being initiated by the early generation of Indonesian LVE trainers and volunteers. After working in initiative phase for 6 years, on 1st December 2008, Karuna Bali Foundation is approved as The Association for Living Values Education Indonesia. 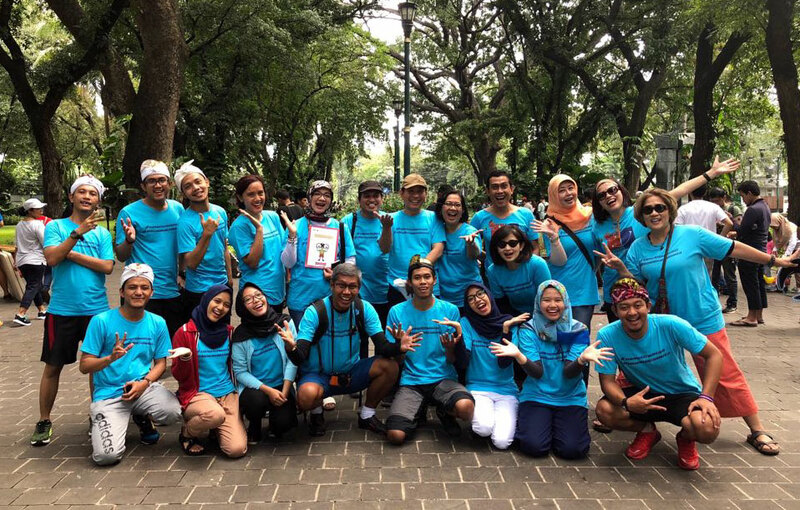 Having been involved with Living Values Education activities has motivated 18 educators and LVE Indonesia NGO Partner's personnel from several cities in Indonesia to commit more to service. To accommodate that, the first LVE Indonesian Train The Trainer Workshop was conducted on 20-25 November 2009, at Yogyakarta, Central Java. Shahida Abdul Samad, Focal Point for LVE in Malaysia was invited to lead the TTT in collaboration with Taka Gani, Irma Makarim and Fidelis Waruwu of Indonesia. The training has not only accommodated participants with knowledge and skill to facilitate LVE activities, but also gave them opportunities to share challenges on their roles as LVE Trainers. 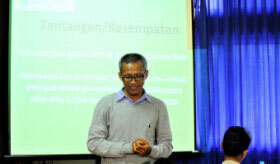 Saefuddin Amsa, educator from Central Java who had been working with the Muslim Community in Aceh said. "I think, as a trainer, we need to know how to communicate unfamiliar phrases such as reflection activity, or the new paradigm of not to teach but to explore values. The second is, we also need to contextualize some concept in LVEP with conditions and traditions in the community. Some concepts may already exist and by contextualizing it, we can help the community to have better comprehension and acceptance." 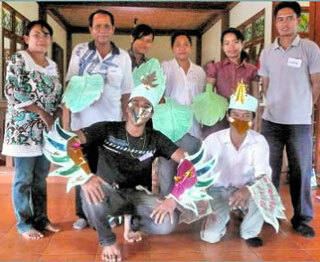 Beside being culturally sensitive, becoming an LVE Trainer is also rewarding. There are some challenges on personal Level. Clare Harvey, Program Officer from The Asia Foundation said, "As an LVE trainer, you are encouraged to really emulate the values. However, this is not an easy thing to do. It's a challenge to stay peaceful when you get back to your daily routine and are in a rush for a meeting." Matias Endar, working for the Catechetic Commission in Bandung Diocese also shared, "To grow a value in community means we have to live it first. People are moved not by our words, but by our actions. Only by living the value and starting to share it, can change then happen in the community." 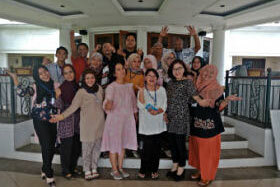 As the sharing continued, the workshop became a melting pot of old and new generations of Indonesian LVE trainers. Irma Makarim, a senior LVE Trainer in Indonesia shared her experience, "At first I didn't want to become a Trainer, because the 'burden' is too heavy. But then I realized, the core of this program is all about me. I have to change first, before the world changes. When I come to trainings, I see my self as a blank page. I have no expectations and come with an open heart. And I think, humility is the key." Taka Gani also emphasized in her sharing, "The first time I became a trainer, I was not convinced that I was ready to carry the title. As a values trainer, you are expected to be as good as what you say. But then I realized, I will grow along with the process and the most important thing is just to be my self." After the Workshop, participants, who were mostly personnel from LVE Indonesia's partner Organization will start assisting LVE implementation in their program. The Jesuit Refugee Service will continue implementing LVEP with their Peace Education Program at schools in Tapaktuan, Aceh. 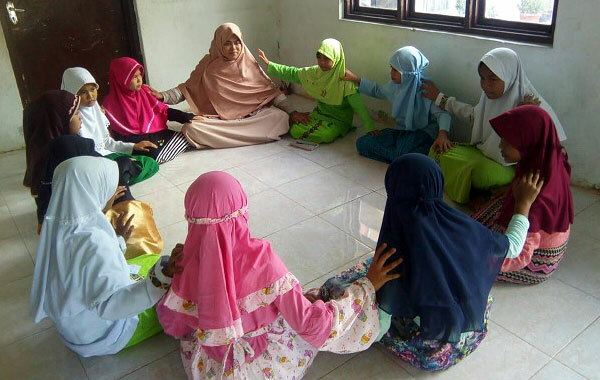 The Asia Foundation who has done school assessment in 2009 will start to implement LVEP in several Pesantren (Islamic Boarding Schools) in Java Area in 2010. 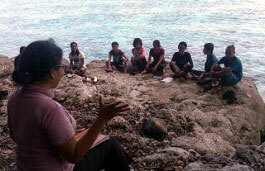 Karuna Bali Foundation will continue implementing LVEP in their school program in Bali. Oher participants who are educators with professional backgrounds in counseling and lecturing will also support LVE activities in their home city or region. at Yayasan Karuna Bali, Ubud. at UIN Syarif Hidayatullah, Jakarta. Conducted by The Asia Foundation. 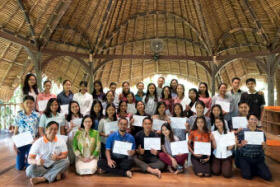 Educator Workshop for Teacher Training Program at Yayasan Karuna Bali, Ubud. Professional Development Seminar and Workshop at Universitas Negeri Yogyakarta. Led by Christopher Drake. 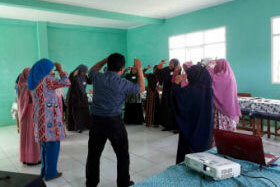 Educator Workshop for School Teachers at Tapaktuan, Aceh. 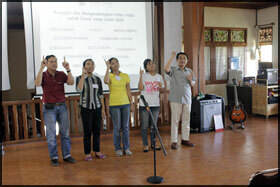 Conducted by Jesuit Refugee Service Indonesia. In total there are more than 30 Educator Workshop, Professional Development Workshop, Presentation and Seminar conducted in several cities in Indonesia, such as Banda Aceh, Tapaktuan, Jakarta, Subang, Sukabumi, Yogyakarta, Salatiga, Solo, Tabanan, Singaraja, Ambon and Ternate; attended by more than 700 participants.